"The state of affairs at [my] house is dreadful (fig. 1). It's that Kihei-don wants (fig. 2) to be called "master" by everyone (fig. 3)." Notice how in the previous sentence (fig. 5 of this post), the 「す」 in 「よふす」 was written with the common 「寸」. Yet just one sentence later, 「春」 was used instead. I'd really like to know if there's any rhyme or reason behind the selection ― perhaps some undertone implied by them. Edit: according to Chris in the comments below, there has been no prior evidence of a pattern in kana selection. Deciphering the kanji for "Kihei" was quite challenging, since there are so many possibilities. The first one was quite easy to determine to be 「鬼」, but for the latter two, I turned to Tangorin's name search. Note that which kana you search with matter ― only 「きへい」 brought up a result with the correct first character （「鬼」）, while only 「きへえ」 brought up results with 「兵衛」 for the second and third kana. The honorific 「どん」 is a dialectic form of 「どの」, a polite suffix, often used for apprentices. In any case, we can assume that it possesses less authority than "master". "Even so (fig. 4), the situation was also like that even when his wife was still in good health, so (fig. 5) why has it turned out like that? (fig. 6)"
The first thing to note here is (from fig. 5) the word 「在世（たつしや）」, which means "being alive" and is read as 「ざいせい」 in modern Japanese. The irregular reading comes from the word 「達者」, meaning "in good health" and read as 「たっしゃ」. The meanings are clearly similar, so Tamenaga just interchanged their readings. Also in fig. 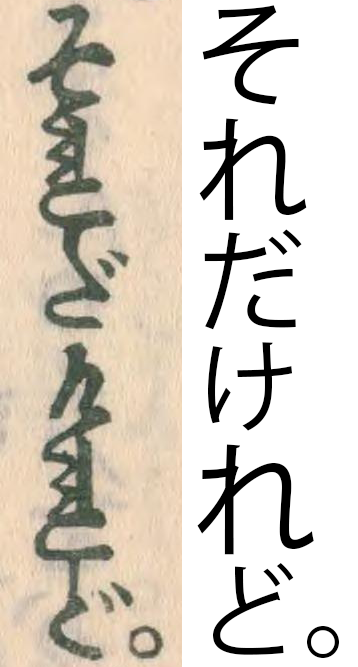 5, note the word 「理由（わけ）」, which uses a rare reading while having the same meaning as 「わけ」 in modern Japanese: "circumstances"/"situation". Finally, at the end of fig. 5 is the phrase 「ものを」, which functions in the same way as it did in the previous post (fig. 2). I've never seen anything that suggests there's any rhyme or reason to the choice of kana -- there's so much variation between texts and even within one text (even writing the same word or quoting the same section of text from one sentence to the next) that it really seems unlikely to me. There would have to be more patterned usage if there were any intent behind it. On a distantly related note, Frellesvig 2010 mentions that in "Sugahara 2000" (キリシタン資料を視点とする中世国語の研究 by 菅原範夫) it is demonstrated that in the "Late Middle Japanese" period (to use Frellesvig's terminology), variant kana were used to distinguish between /tu/ and final /-t/ -- which was mostly found in Sino-Japanese morphemes which have all normalized to /-tu/ or /-ti/ now, but we can see the evidence for it in the Portuguese romanizations, Noh dialogue (/koNniQta:/ for /koNniti wa/) etc. Not that this is relevant to this post, but hey, on what other blog would this stuff be even close to on-topic? Wow, this is very interesting. I'm no expert on phonology, but I didn't know there was ever a time when there was a final consonant other than the moraic nasal 「ん」 in premodern Japanese. As for the Sinitic origin, according to Wikipedia, "The only syllable-final consonants in modern Mandarin are -n and -ng, and -r". Of course, Mandarin is known for its relative phonemic paucity compared to other Sinitic dialects, so this influence is probably from Cantonese, where final /-t/ still exists. Indeed, 「今日」 is read in Cantonese to this day as "gam1jat6". This also reminds me of how 「ッ」 can be used in Ainu katakana to represent final /-t/'s (as well as sokuon). Do you know if the normalization of some final /-t/'s to /-tu/ played a role in the decision to use a little 「つ」 to represent sokuon? I don't know a lot about this topic, but I understand there is evidence to suggest that at least through the Heian period, Sino-Japanese loan words were pronounced closer to Chinese pronunciation than they are now. It took some time before the Sino-Japanese terms were pronounced completely with native phonology. If you look at yomi-kudashi of kanbun from the Nara-Heian period, they use little or no Sino-Japanese readings, so it seems like they recognized a much bigger separation between Chinese and Japanese than developed later. Which I guess it to be expected when they were still actively going to China.